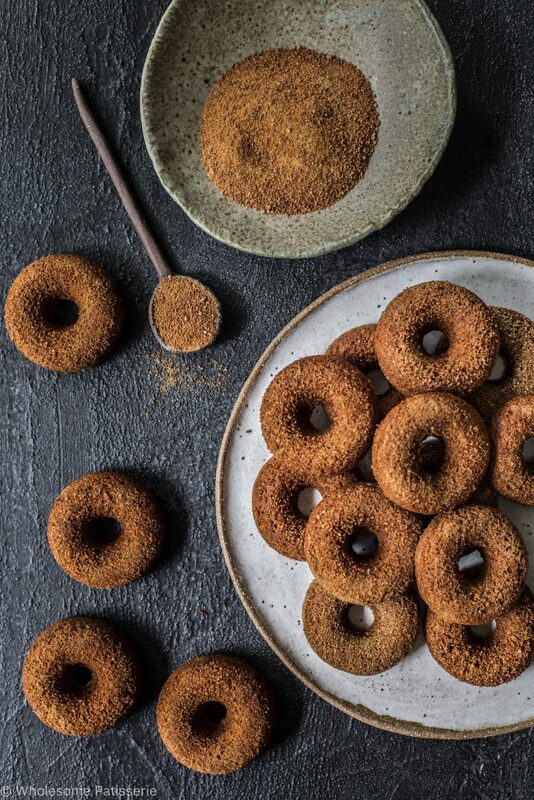 Cinnamon Sugar Donuts! Oh and guess what… they’re vegan, gluten free and refined sugar free…. i got you. 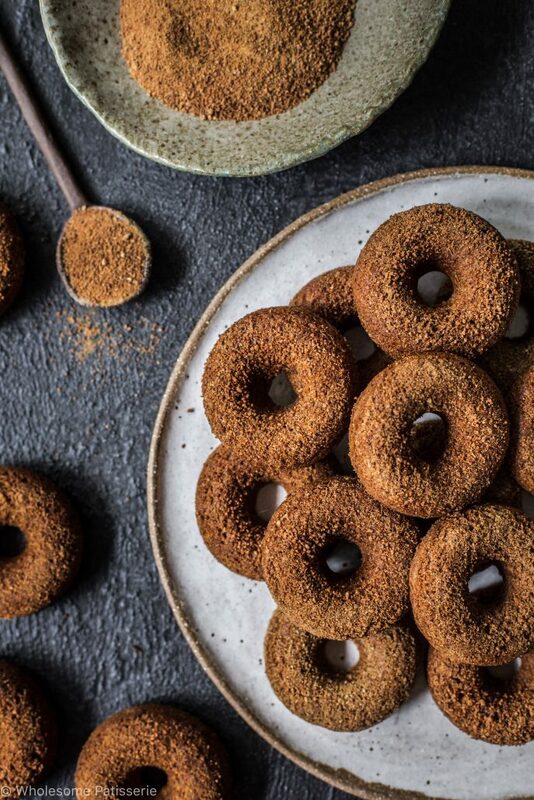 So although these scrumptious donuts aren’t your typical “doughnut” made from yeast dough and deep fried in a bunch of sizzling hot vegetable oil (yikes!- don’t you agree?) these are more “cake like texture” donuts! Much healthier for you – baked not fried. Not that I’m completely adverse to traditional donuts, i enjoy them every so often but i’m trying my best to make better sweet treat options and what better way to do that other than make it yourself! So basically, this recipe is a cake recipe but i have adjusted my go-to chocolate cake recipe into this, voila! Made small changes to make the texture of these donuts more, well, “doughy”. They’re still light and fluffy after you make them but the next day, especially after refrigerating them, they turn a little more chewy and dough-nutty! I’m pretty good with my words today hey? PS. is it donuts or doughnuts? I’m confused, teach me! So my all time favourite donut flavour is by far, cinnamon sugar! I remember when I was young and my Mum used to always get me some cinnamon sugar donuts as a treat. We also used to buy a packet of cinnamon sugar donut holes (omg.the.best.). We don’t do that anymore because for one, my Mum is strictly gluten free and I’ve also pretty much gone gluten free, we all have as a family. Oh and I’m on and off the healthy bandwagon, my will power is like a rollercoaster when it comes to deletable baked goods! 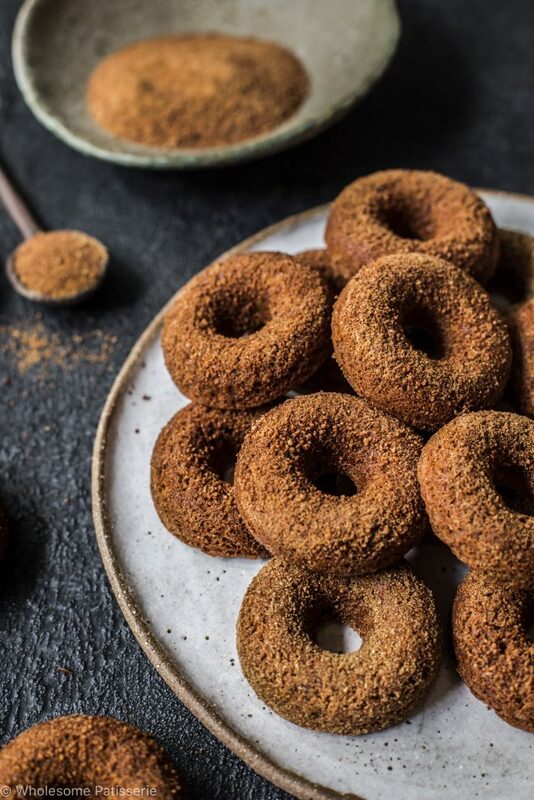 So enough rambling on, I think it’s time for you to bake up a batch of these delicious gluten free, refined sugar free and vegan donuts! Yum Yum Yum!!! In a large mixing bowl, combine flour, sugar, baking powder, baking soda and cinnamon. Mix well to combine. Pour in milk, melted coconut oil and thickened flax egg. Using a hand mixer or a stand mixer fitted with the paddle attachment, beat the mixture on medium speed for 1 minute until smooth and well combined. Spoon batter into a piping bag fitted with a medium sized round nozzle and pipe batter into donut molds, filling ⅔ of the way up the molds. You can also carefully spoon the batter into the molds. Carefully remove donuts and place on a wire rack to cool. Use a butter knife around the edges to help remove them. Combine coconut sugar and cinnamon in a small mixing bowl, mix well. 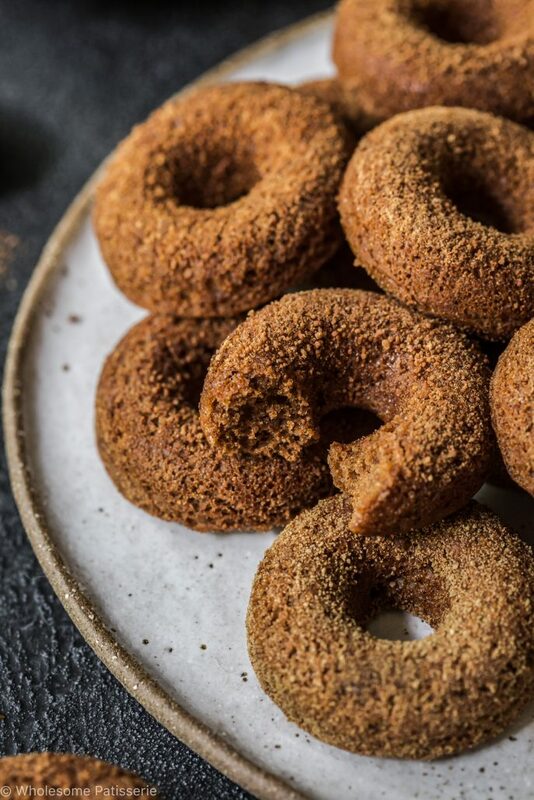 Once donuts have cooled for about 5-10 minutes, gently place one donut into the cinnamon sugar and coat well, shaking off any excess and place back onto the cooling rack. Repeat with remaining donuts. NOTE: top up cinnamon sugar with both ingredients if you begin to run out. Serve still warm or cool down to room temperature. NOTE: Store donuts in an airtight container, refrigerated. As the sugar may begin to dissolve into the donuts, making them sticky. Best consumed after cooling them down or store them for 2-3 days. Waw, these donuts are a must try! Cinnamon is my favorite flavor in baked goods so I think these are made for my taste buds. I love the fact that they are vegan, yaay! Can’t wait to make them. Also, your photography is on another level! I desperately need to take notes for my own blog. Can you use regular eggs instead of flax eggs? How many regular eggs to use for this recipe? :) thanks!